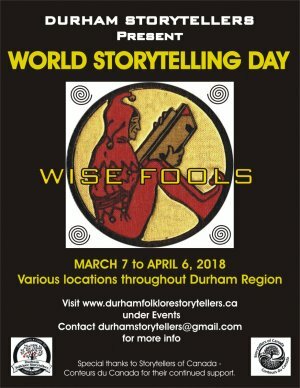 DURHAM STORYTELLERS PRESENT 'WISE FOOLS' FOR WORLD STORYTELLING DAY 2018. Come join us for an afternoon or evening of storytelling on March 9 at 2:00 pm at Faith United Church 1778 Nash Rd, Courtice, ON (all ages), March 20 at 7:00 pm at Port Perry Villa, 15987 Simcoe St. Port Perry (adults), March 28 at 10:30 am at the Ajax Public Library, 55 Harwood Ave S, Ajax (children/all ages), and April 6 at 2:00 pm at Traditions of Durham Retirement Residence, 1255 Bloor St E, Oshawa, (adults). March 15 at 7:00 pm A special World Storytelling Day program with featured storytellers will take place at Northview Community Centre, 150 Beatrice St. E., Oshawa (adults) during our regular monthly storytelling gathering; there will be an open mic following. Come Listen, Come Tell, Catch the Magic! **Also, please note that our regular monthly meeting time has changed to 7 p.m. (instead of 7:30) as of March 15, 2018. Everything else is the same.